A six-week-old baby has re-defined the meaning of miracle after he survived being catapulted out of a car traveling at a speed of 70 mph on the M6 motorway. 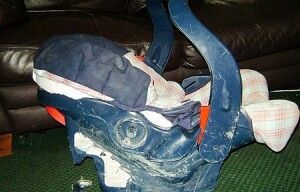 Jonathan Samuel was strapped in his car seat when his father’s car tire blew and then spun around 6 times. The baby, still in his infant seat, was then thrown from the car, where he bounced along the side lane and slid out of the harness before stopping at the edge of the highway. But all of a sudden the father heard his baby cry and that is when he spotted him and cradled him to safety before any other mishap. Tiffani Thiessen Welcomes a Baby Girl! Dean McDermott Has His Hands Full in NYC! What a great miracle – I am so happy for this family. I am curious as to why the seat left the car and why the baby came out of his harness. If the seat was installed correctly it should have stayed in the car and if the harness system was correctly fitted how did he slide out?